Did you guys get the latest issue of Pipes and Cigars? Chick Pipe Alert on page 48. I'm not sure what to think of that. I want to like it, really I do... but painting over the whole surface just screams "bad grain!" to me. Would you let yourself be caught smoking that thing? Haven't seen it. 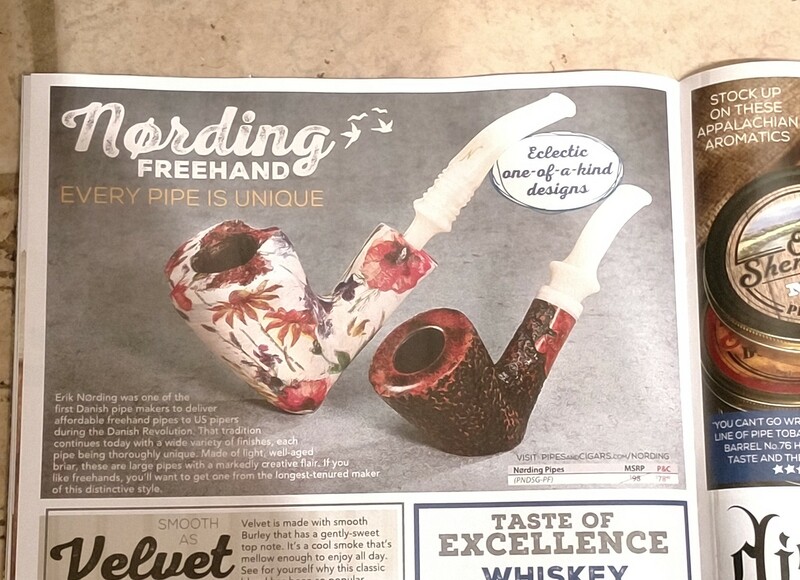 Is it one of those Anne Julie pipes? If so....PSSSSH! I don't know what an Anne Julie pipe is, but this is painted white with like, coneflowers all over it. Ann Julie is a pipe maker from Denmark and her pipes look flowery. Last edited by Jake on Fri Jan 25, 2019 9:17 pm, edited 1 time in total. Hahaha! Perfect timing with the pic. So tell me... what do you think of it? I like it more than my former mention. Though if I were going to buy one with flowers on it, I'd go with a Tsuge. Bet would couldn't do that again! If that was a gift to me, I would sand it down to bare wood, buff it and keep a clean finish. NO WAY would I be caught smoking that! Nording has several freehands that have weird designs like that on them. I think it's just confined to their "Harmony" series. I'm not fond of them either. Thanks for sharing that. Hmm, yeah... not a fan. I dislike the half-toning almost as much as I dislike those flowers on the other one. I might like a similar design that is stained with the artwork rather than painted or printed. Maybe I will experiment with that on one of my old drugstore pipes. I basically said What th' WHAT? and showed her and she made a face.